The capacity of your external flash drive or SD card is large: 8GB, 16GB, or more. There is enough free space on the drive. You can copy the smaller files to the external drive just fine. Yet, when you attempt to copy a large file (4GB or larger) to the external drive, Windows gives you an error (such as: There is not enough free space on the drive, or similar.) Does this sound familiar? If you experience such a problem, most probably it’s caused by the fact that your external drive or card is formatted with the FAT32 file system. This type of a file system has a built-in limitation on the size of the files that it may contain. Although the total size of the files that you can copy to a FAT32 drive could be as large as 2TB (or the physical capacity of the drive, whichever is smaller), the size of each individual file may not exceed 4GB. This limitation may sound silly: why would anyone design a system that would not allow for the larger files? The problem is, when the FAT32 file system was designed (that was back in the days of Windows 95), no one anticipated that we would have such large files in use today. Or, maybe the designers hoped that by the time such large files become common, the use of the FAT32 system would be replaced by the more modern systems. In any case, how to solve the problem of copying the 4GB files? Easy: you need to replace the FAT32 file system on the drive with a more modern one, such as NTFS or exFAT. These newer file systems not have the 4GB file size limitation! Scroll down this page for the instructions on how to change the file system. Which file system is better, NTFS or exFAT? They both a pretty good, but which one to choose depends on how else you are going to use the external drive or SD card. The NTFS file system is supported by all modern versions of Windows (including such dinosaurs as Windows XP, Windows 2000, and Windows NT), and it also supports many other functions not supported by FAT32: file security, encryption, compression, etc. However, if you plan to use the external drive with non-Windows devices (such as an Android tablet or a Mac computer), it would not be recognized by such devices out of the box, and you would need to install additional software or tweak their settings quite a bit to make them work with the NTFS drives. The exFAT system is not as advanced as NTFS, but it has more support on the non-Windows platforms. For example, many Android phones and tablets, as well as the recent versions of macOS support exFAT devices pretty well. How to change the drive from FAT32 to NTFS or exFAT format? 1. Attach the external flash drive to the computer, wait for Windows to recognize it and assign a new drive letter to it. 6. Make sure to select NTFS in the File System drop-down list. That’s what determines the kind of a file system that the drive should have. Also, you may want to select the Quick Format option, which should speed up the formatting process quite considerably. 8. If you’ve selected the Quick format option, the formatting should take no longer than a minute or two. As a result, you should have the same drive, but now it should have the NTFS files system on it. Now you should be able to copy the files larger than 4GB to the drive just fine. 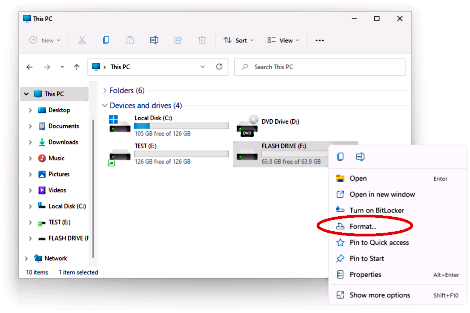 In addition to formatting a drive with the NTFS file system, Windows also offers a way to convert a FAT32 drive to NTFS. The difference is that the conversion process would keep the existing files on the drive. See Windows Help and Support of your computer for the instructions on how to do the conversion. What if I want to use exFAT instead of NTFS? The steps to change to exFAT are the same as for NTFS, you only need to select exFAT in the dropdown box instead of NTFS. P.S. Our encryption software USBCrypt can create a NTFS- or exFAT-formatted Virtual Encrypted Disk even if the host drive is formatted with FAT32. This suggests yet another solution: instead of formatting the host disk with NTFS, you can instead use USBCrypt to create a NTFS-formatted Virtual Encrypted Disk. If you do that, then in addition to breaking the 4GB file size barrier, you would also get the strong security and password protection for files you put inside of the Virtual Encrypted Disk. See the USBCrypt web page for more information or to download a free 30-day trial. P.P.S. If you only need to transfer a large file from one computer to another, you can get by with the FAT format if you use a file splitter utility, like the one included in our file manager AB Commander. Using its Split command, you can split a large file into smaller chunks (say, 2GB each). Such chunks can be put on a FAT-formatted drive without a problem. Then, on the destination computer, use the Merge command to combine the chunks together into the original file. Of course, if you want to open the file directly from the external FAT drive, this won’t help you, but just to transfer the file between Windows computers should work fine. P.P.P.S. Here is what to do if Windows does not offer the NTFS format option. Warum kann ich keine großen Dateien mit mehr als 4 GB auf meinen USB-Stick kopieren? ¿Por qué no puedo copiar archivos superiores a 4 GB en mi dispositivo flash USB? Pourquoi ne puis-je pas copier des fichiers volumineux, de plus de 4 GB sur ma clé USB ? SUPER QUICK AND WORKED, THANKS A LOT! Perfect advice, worked without any problems, thanks! I just tried it and now the app for U-Drive on my phone won’t recognize the flash drive when I plug it in. Any advice? @Ebony: most probably, your phone does not support the NTFS format. You may want to try exFAT instead. Good luck! Thank you very much for this help! I had no idea about this limitation and was about to destroy my USB with a sledgehammer. No need for that anymore! This worked quite well, and solved my problem. Thank you so much for sharing it! This was just AMAZING, it helped me soo soo much. I’m really happy. Thank you. What a usefull advice! Thanks a lot! Thank you so much for the help, almost had a mini heart-attack! This information has not only helped me, but it has also educated me on the different formats used by computers. wow! thank you soo much! worked! thank you it was very usefull. thanks a lot, very good tutorial! I thought I would have to buy another thumbdrive. I couldn’t move a 4.5 GB video file to a 16 GB thumbdrive. There a lot of buttons I don’t know what they do. I learned “format” meant to wipe clean a SD card, etc. I now have learned there is more to it to a simple reformat. Thank you. It’s a great article. Thanks a lot for that. Thank you so much for this, very frustrating issue to have and after formating it to erase everything completely my 14GB USB was still saying it was full when trying to move a 5GB file over, it’s so frustrating. Changing the system fixed it completely though. Many thanks, worked a treat and I’ve learnt something new! Helpful! Thank you so much. Good work! Thank you so much! Now I can copy my movies. Tnx. Very helpful and thank you for showing a step by step guide! Really appreciate the history behind the FAT32 and being able to go above its limitations for above 4gb file transfer using your content! Excellent, concise and helpful. Can you now fix the rest of the world ? What is nine minus 6 ?